Their posture may explain why ‘manly’ British men didn’t become fencing masters! For a good deal of the 18th century, a gentleman’s dress would include wearing a small sword. How far this might ever need to be used in anger, or for personal defence, is uncertain. However, it did no harm to have some idea at least of fighting with such a weapon. Fencing masters supplied the necessary training. What’s odd is that, like singing and dancing masters, most were from overseas. It seems Englishmen were unwilling either to gain the necessary skills or demean themselves by teaching! Here’s a telling paragraph from “Sidelights on the Georgian Period” (1902), written by ‘George Paston’ – a nom de plume used by Emily Morse Symonds. A century and a half ago, when the small sword was a common accessory of the toilet, and a duel the natural outcome  of a hasty word or even an unguarded look; when, consequently, men’s lives depended upon their skill in tierce and carte , the fencing master was a power in the land. Not only was he hand-in-glove with his fellow artists of the bow and the brush , but he was the spoiled child of royal and noble circles, and took rank as an aristocrat in upper Bohemia. The most distinguished members of the profession were usually of French or Italian origin, since Englishmen, born sportsmen and fighters though they be, are seldom more than glorified amateurs in art, even in the noble art of self-defence. Where strength and courage are the chief elements of success, as in boxing, wrestling, quarter-staff play, and rough-riding, they are easily first; but in the fencing salon and the manége they have generally been eclipsed, in point of grace and finish, by their French and Italian rivals. I think that translates as suggesting the English are best at ‘manly’, tough sports, while effete continentals are all ‘grace and finish’! It also ignores the obvious point that fencing was as much a source of graceful exercise as a training in sword-fighting; though perhaps graceful exercise was also seen as effete! A considerable, if colourful exaggeration. Duels were never that common. Teachers of music and drawing or painting. 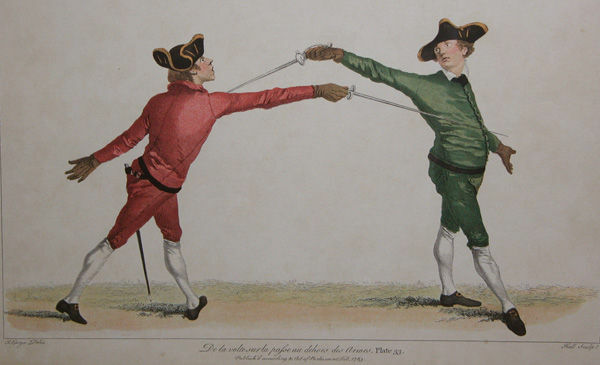 How interesting that fencing masters were French or Italian. I’ve never read of fencing being a huge thing in Colonial America – will have to check that out! I think it may have applied to old aristocratic families before the Civil War. But so many of them were killed off or emigrated, the plebs rose up to fill their space on the social tree but without the weaponry training. That said , some claim that the most important of Beau Nash’s rules was to ban swords at Bath, so putting an end to duels there. The dress of a mid to late-18th century ‘Macaroni’ dandy certainly included a sword; and I think some, at least, of the new ex-middling sort gentry would have wished to dress in an ‘aristocratic’ way—if only to show they had arrived. I suspect wearing swords (at least when dressed up on grand occasions) lasted well into the early 19th century. Thanks for pointing it out. I’ll try to get it sorted. d’Angelo was one such fencing master. He “wrote” a book about fencing poses and one for the cavalry on using a sword on horseback. I think that the students at places like Eton could pay extra for fencing lessons. Up until the 19th century the swords were not just fashion statements. They were replaced by pocket pistols . Alas, pistols didn’t encourage the grace and elegance in movements that swords did. Sword fighting was lethal but practice could be as graceful as dancing.